Planets seem like a foreign idea to most but there is quite a bit of information and research we have about the planets in our solar system. It has been said that we know more about our neighboring planets than we do our own oceans. With a solar system that has been in place for billions of years, there is so much history so far away that has yet to be discovered. The planets closest to the sun, Mercury, Venus, Earth, and Mars are all terrestrial planets. These planets have solid, rock-like surfaces which are quite different from earth. These planets are also, naturally, uninhabitable for humans. They have varying atmospheric differences that make them impossible for humans to naturally breathe. As well, the two outer planets beyond Mars’ orbit, Jupiter and Saturn, are known as “gas giants” while Uranus and Neptune are dubbed “ice giants”. NASA is at the forefront of obtaining more information about our planets. Voyager 1 and 2, launched by NASA, are the first space crafts to explore the outer reaches of earth’s solar system. Pluto has been downgraded from a planet to now considered a dwarf planet. With the redefinition of a planets and dwarf planets, new dwarf planets have been identified. These dwarf planets reside in the Kuiper Belt, which is past Neptune. This is information that has lead researchers to believe that there is an existence of a ninth planet. The California Institute of Technology believes that Planet Nine does in fact exist but it is also 10 times the size of Earth’s mass. Planet Nine is so far out of the norm circumference of this solar system that takes 20,000 Earth years to completely orbit the sun. The search for a planet similar to earth has not been that successful in the past few years. It was not until NASA’s Kepler telescope discovered over 3 thousand planets. With researchers making some great strides to an Earth 2.0, many have been a bit unsuccessful. There is a new European observatory that is expected to be completed by 2024 with the goal of finding that Earth 2.0. A planet similar to Earth would give society something to compare our world to. It would also further the discussion of life in space and a place where humans could travel to. We often wonder if somewhere hidden on Mars are the building blocks for life. But what about building blocks for a civilization? A new study suggests that the material humanity needs to one day construct houses, buildings and even entire colonies on Mars may already exist within the red planet’s own desolate soil. The research is still early and the technology is unlikely to be ready in time to meet President Trump’s stated goal of putting people on Mars by the end of his first term, but it could lay the groundwork for settlement of the planet if further study and testing confirms its findings. “If this can indeed be scaled up for mass production on Mars, then I would say we are lucky,” said Yu Qiao, a materials scientist and engineer at the University of California, San Diego, pointing out that soil on the moon does not share that ability. He and his colleagues published their work Thursday in the journal Scientific Reports. Dr. Qiao and his colleagues experimented with a substance that is chemically and physically similar to what you might find on the surface of Mars, but is made from particles on our planet. They call it Martian soil simulant. Quite by accident, the team members found that with enough pressure they could mash the mock Martian dirt into bricks — no extraterrestrial kiln needed. The technique, if it works with real Martian soil, could make it possible to develop building material on Mars without needing extreme heat, water or a binding agent. Though the bricks they created were small, they were stronger than steel-reinforced concrete, Dr. Qiao said. His team had previously worked with an analogue for lunar soil, which needs a binding agent that acts like glue in order to be compressed into a brick. The idea behind that research was that one day astronauts would take the binding agent with them to the moon, mix it with the soil and then compact it into blocks that they could use to make structures. After that work, his team set their eyes on Mars. 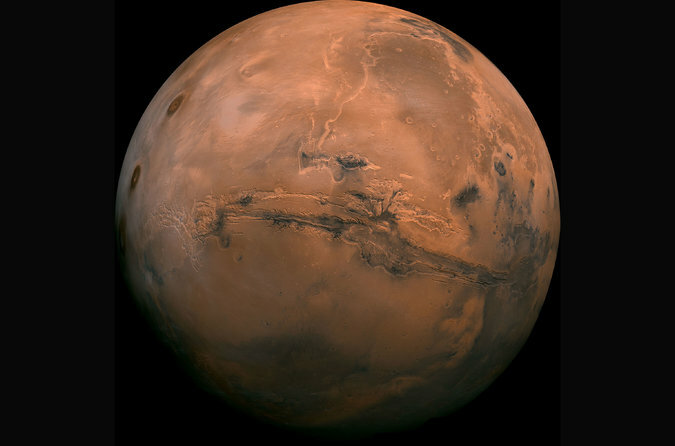 They realized they could produce the same kind of bricks for the red planet with smaller and smaller amounts of their space glue, until they found they could make Martian bricks by using pressure without a bonding agent. I thought, ‘What is going on? !’” Dr. Qiao said. The team members think that the iron oxide, which gives the soil its red color, acts like a glue to hold the particles together after it is subjected to enough pressure. Dr. Qiao said his next step was to investigate whether the technique could create larger bricks that could potentially build a house. “The paper is an interesting step in the right direction of development of building material for future explorers,” said Jon Rask, a research scientist at NASA who was not involved in the study. He said he would like to see this research conducted under extremely cold and dry conditions that mirror Mars’s atmosphere to see if the results would hold up. Henning Roedel, a doctoral candidate at Stanford University who studies technology for construction in outer space, said in an email that scaling the method could prove to be a challenge. Still, he called the technique an elegant solution to the problem of building on other planetary bodies. Some exciting news has emerged from NASA’s Goddard Space Flight Center based in Greenbelt, Maryland. There, NASA engineers oversaw 2 deployments of the James Webb Space Telescope’s wings. Properly functioning sides of the structure are critical to the overall viability of the telescope because they compose the framework that will house its mirrors. Each deployment can last sixteen hours or more to complete, and the process requires multiple teams and very specific communication. Once the James Webb Space telescope if assembled in full, the completed structure will be larger than any existing rocket that would have the capacity to launch it into space. Knowing this limitation, the engineering team behind the telescope came imagined, designed and created a telescope with the ability to fold up (similar to an origami piece) and fit inside a rocket. After the rocket launches, Webb will continue on to its destination located roughly 1 million miles away. To see more about these developments about the James Webb Space Telescope, see the video below or find them on Twitter. Earlier this month, NASA’s New Horizons spacecraft made headlines. July 14th marked the first time that a spacecraft successfully explored the dwarf planet Pluto up close. After hurtling through our solar system for over a decade at a speed of over 30,000 miles per hour, New Horizons finally reached its closest approach to Pluto, approximately 7,750 miles from the surface on July 14th. This was the first-ever space mission that successfully explored a world so distant from Earth. New Horizons gathered data as it approached the planet, but by Wednesday, the information made its way back to Earthbound scientists and the rest of the world. “The mountains likely formed no more than 100 million years ago — mere youngsters relative to the 4.56-billion-year age of the solar system — and may still be in the process of building”. This information means that a small percentage of Pluto’s surface is in fact active to this day! This coupled with the seemingly unblemished nature of the surface of the planet imply that Pluto is fairly young compared to the other systems that we’ve been able to observe within our solar system. Both methane and nitrogen ice cover a large portion of Pluto’s surface, but these materials aren’t durable enough to be responsible for the mountains. It’s more likely that the stronger material of water ice created these mountains. Because Pluto is so cold, water maintains properties that are more similar to rock than to ice. Scientists have already gleaned a lot of information from these first images of Pluto, and in 16 months a cache of computer data from New Horizons will make it’s way back to our planet. It will be exciting to see what we glean from that. Hollywood films have been preoccupied with the idea of comets and asteroids threatening our very existence for a long time. From blockbusters like Armageddon and Deep Impact to art films like Melancholia, the threat of space debris destroying the earth is a surprisingly common theme. These kinds of films tend to display very creative interpretations of fact and dramatize this potential threat from space in order to keep viewers interested. However, it is interesting to note that the US government is beginning to catch up to the plots of these films by announcing an agreement to begin working on planetary defense. The nation’s agencies that build civilian rockets and nuclear arms revealed on Wednesday that they will collaborate in order to deflect asteroids and comets that pose a threat to cities or possibly the planet. For years both NASA and the National Nuclear Security Administration — have researched threats of rocky debris from space independently. Both have assessed the space debris, proposed new designs for rocket interceptors and run computer simulations to test if a nuclear blast could force a massive asteroid onto a different trajectory. Even so, this new interagency pact will formalize the cooperation between the two. The hope is that the two agencies will now be able to better coordinate governmental planning that would lead to better solutions for deflecting this kind of threat. In 2013, a 7,000-ton meteoroid exploded over a city in Russia which injured approximately 1500 people. This tragedy in Chelyabinsk illustrates the potential risk of cosmic debris. In public interviews officials refuse to comment on whether or not any arms in the nation’s nuclear arsenal have been set aside for countering extraterrestrial strikes. However, it is acknowledged that there is a discussion surrounding possible nuclear options. Regardless of the true threat of rock debris crashing into our planet and causing large-scale damage, it is encouraging to see government agencies working together in an effort to combat this kind of potential threat in the future. To learn more, see this article from the New York Times.